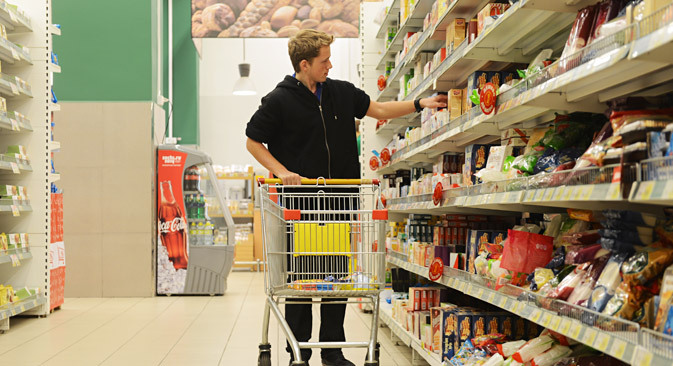 Russian authorities may bring back the sales tax that was in force in Russia during the 1990s. The government feels that increasing the tax burden could be one approach to solving the problem of regional budget shortfalls caused by shrinking economic growth and the introduction of sanctions against Russia. The Russian Ministry of Finance, on orders of President Vladimir Putin, has prepared and published a draft bill on allowing the regions to introduce a sales tax. Under the bill, the maximum tax rate would be set at 3 percent. The regions, if they wish, will be able to set a lower rate, but it must be the same for everyone – the draft bill prohibits differentiating the rate based on types of commodities and categories of taxpayers. However, the tax will not be charged on the sale of vital necessities such as bread, milk and dairy products, edible oils, margarine, flour, cereals, sugar, salt, potatoes, as well as medicines for children and diabetics, children’s clothing and shoes. “An increase in the tax burden is a search for additional budget revenues which have fallen due to the deteriorating domestic economic situation,” says Dmitry Bedenkov, head of the analytical department of the IC Russ-Invest. “The Russian economy is showing signs of slowing down, and according to some parameters, there are serious concerns about a possible slippage into a recession,” says Bedenkov. According to him, in this context the search for additional sources of budget revenues looks reasonable. However, the expert notes that a tax increase may reinforce negative trends and lead to a growth in inflation. Low consumer activity may reduce the expected impact of the introduction of a sales tax, which will lead to additional inflationary pressures. At the moment, according to the Ministry of Economic Development of Russia, the regional budget deficits come to about 1 percent of GDP. This has occurred due to an increase in the salaries of employees working in state enterprises, which was brought in across the country in May 2014 by the decree of President Vladimir Putin. According to the Ministry of Finance, the new tax would annually bring about 200 billion rubles ($5.6 billion) to the governors, although regional budget deficits could reach about 800 billion rubles ($22 billion). “In the Russian regions there is currently a gradually growing problem regarding budget deficits, which may increase in the coming years against the backdrop of a stagnant national economy,” says Anton Soroko, an analyst at the Finam Investment Holding. According to Soroko, the most severe drop in budget revenues came from taxes on corporate profits, because most manufacturers in 2013 had significantly reduced their margins. Moreover, the borrowing capacities of the regions are limited because of the extremely unfavorable conditions in the markets caused by the imposition of sanctions against Russia. It is worth noting that Russia has already had a sales tax enacted – it was introduced in 1998, but it was then found to be ineffective and was repealed in 2003. Also a regional tax, its rate was determined by the regional authorities. Furthermore, the Constitutional Court (CC) of Russia in 2003 recognized the simultaneous charging of value-added tax (VAT) and sales tax as unconstitutional. The fact is that in international practice, it is common to either to levy VAT, as in the EU, or a sales tax, as in the United States. Therefore since 2006, the Ministry of Finance has consistently rejected the idea of ​​reviving the sales tax, not just because of the legal issues, but also the complex administrative burden and the potential problems of collecting such a tax. “In reality, this tax would increase the tax burden on businesses and lead to higher prices for consumers and, in spite of the apparent simplicity of its administration, the prospects of its effective collection are quite pessimistic,” says Nina Kozlova, head of management and legal consulting at FinExpertiza. According to Timur Nigmatullin, an analyst at Investkafe, in the conditions of slowing economic growth, it is necessary to find new sources of income, but a tax increase is not an option. “A drastic measure such as the introduction of a new tax would likely only exacerbate the current economic situation in Russia, as it would, in the long term, lead to the acceleration of inflation and a further reduction in household consumption,” said the expert. According to Nigmatullin, for the government to get out of this predicament in the future, it will nevertheless have to cut military spending in order to reduce the budget deficit. As an alternative, the Russian government has also proposed to increase the national VAT from 18 to 20 percent. According to analysts at Deutsche Bank, this would bring about 500 billion rubles ($14 billion) into the budget. However, if Russia brings back the sales tax, then this initiative will not be considered.